What could be more idyllic than a beautiful wedding on postcard picture perfect Nantucket Island? Beth Carmichael is orchestrating the event from the grave seven years after her death from ovarian cancer. When she knew that she would not be alive for her youngest daughter, Jenna's, courtship and marriage she recorded all the details of an ideal wedding day, commenting on every aspect from the choice of a groom to the choice of a honeymoon destination. She meticulously compiled a list of her recommendations in a binder she called " The Notebook" and now Jenna and her sister Margot are following through on their mother's plans, down to selecting the flavor of the icing on the wedding cake. Jenna seems to have found her ideal groom in Stuart Graham and the two young people optimistically look forward to a happy life together even though they are surrounded by friends and relatives who could be poster children for dysfunctional marriages. Newly-divorced Margot initially tries to convince Jenna to forgo marriage because she feels that love dies, but she gets caught up in trying to prove herself the successful, competent daughter by fulfilling all of her mother's wishes. Stuart's parents, although married, divorced and remarried to each other, are forced to acknowledge an extra branch on their family tree due to the birth of Stuart's young half-brother who was born as the result of his father extra-marital affair. Jenna and Margot's father Doug realizes after his hasty marriage to a new wife that he still loves his dead wife, Beth. The beautiful wedding on the beautiful day serves as a vivid contrast to the harsh reality of their lives, reminding the characters that life may not always seem beautiful, but the right outlook can make it so. 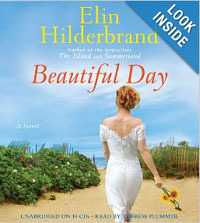 Elin Hilderbrand's addition to her Nantucket-based collection is captivating and thought-provoking. Coming from privileged backgrounds, the Carmichaels and Grahams descend on Nantucket with the confidence of natives while taking the reader along for an insider's peek at the extravagance of New England summer royalty. Told from multiple points of view, with Therese Plummer's expert narration, this audiobook gives the reader the sensation of being one of the actual wedding guests. Doug and Margot's thoughts and comments add intimacy to the listening experience making the audience part of the circle of assorted friends and relatives. Beautiful Day is both entertaining and thought-provoking with its treatment of damaged relationships and the redemptive power of love-both self-love and the appreciation of others. The book is very satisfying because of its sun-kissed seaside locale and its flawed, but likable characters.